Join us in Florida to celebrate a aspecial occasion! Whether you're planning a trip for the entire family or traveling for athletic competitions we have the perfect vacation rentals to suite your needs. Contact our office for additional details on booking large group trip. Navarre Beach is the perfect "Slice of Paradise" on the emerald coast to host your family reunion! 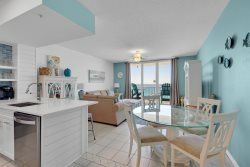 Our large Beach houses are perfect for families that all want to stay all under one roof, or our multiple beach front condominiums will have the whole family together in one building. Navarre Properties' reservation specialists will make sure to help you find the perfect accommodations. We want to make sure that your vacation memories will last a lifetime. We strongly support our military and appreciate the sacrifices made for our freedom. We always offer a discount for Retired and Active Duty military, please ask for the promo-code when making an online reservation. The Panhandle of Florida is known for its love of sports! Navarre Properties would love to help your sports team find the perfect place to rest your heads after a long day on the field. Please talk to our reservation specialists about group discounts and rates.